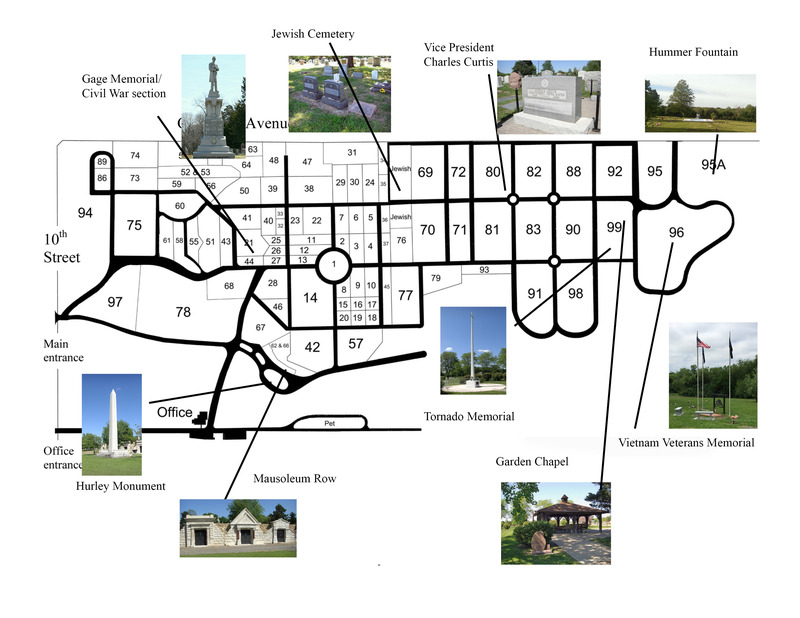 The nine mausoleums in Topeka Cemetery were on the National Register of Historic Places before the rest of the cemetery joined the roster, both for their architecture and for the histories of those who had them built. Of the nine, two are unoccupied. The Moeser family is buried in the cemetery despite there being crypts in the mausoleum engraved with names. The Crane mausoleum was always used as a temporary storage site. Facing Mausoleum Row is the monument to James Edwin Hurley, general manager of the Atchison, Topeka and Santa Fe Railway. The obelisk is 40 feet high and weighs 30 tons. Made of Barre granite, it was a spectacle when it arrived by rail in Topeka. The bridges between the cemetery and the Santa Fe depot were reinforced to support its weight, and teams of 36 to 40 mules hauled it to the site. More than 1,000 people attended the dedication in 1912. The $8,000 cost (more than $200,000 in 2018 dollars) was paid for through collections from employees all along Santa Fe’s train routes. The inscription was carved by Solon Borglund, a sculptor whose works depicted frontier life. Borglund’s brother, Gutzon, and his nephew, Lincoln Borglund, are credited with the creation of Mount Rushmore. Hurley is buried in front of the monument, and his wife, Belle, is buried in front of the concrete pad that once held a 300-pound bronze urn placed there in her honor. The urn was stolen in October 2014. The Jewish Cemetery is north of Sections 69 and 70. When it was created in 1874, it was outside Topeka Cemetery on its south boundary. In the 1910s, Topeka Cemetery purchased an area to the south that doubled its acreage. The cemetery is owned by Temple Beth Sholom and is believed to be the second oldest Jewish cemetery in the state. 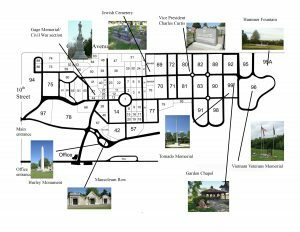 While the temple retains ownership and control of these sections, Topeka Cemetery manages the sale of spaces and burial services. Both maintain burial records. It is tradition in this faith to place a rock on the grave marker when visiting. The Garden Chapel, adjacent to the east road about halfway between the Curtis memorial and the south entrance gate, provides a sheltered place for families to say their final goodbyes. The chapel also is used for full services when no church or funeral home service is planned. Seating is provided, as well as a bier for the casket. After the 1966 tornado, a large white cross was erected on Burnett’s Mound, where the killer twister first touched down. A plaque with the names of the 16 people who died in the June 8 storm was included. It was a gift to the city from Louise and Dana Hummer. Vandals would not let the monument stand in peace, so Dana Hummer, who was police chief when the tornado hit, facilitated its move to Topeka Cemetery. It stands west of the Garden Chapel. The bell tower in Section 96 on the far south end of the cemetery was erected as a memorial to Michael Bowen, who died in 2001. Each year, Vietnam veterans gather here on Memorial Day to pay homage to their comrades. It is marked by a trio of flags – U.S., state and POW/MIA. The fountain that beautifies Section 95A was a gift from Louise and Dana Hummer and honors their late daughter, Nancy. Mrs. Hummer (1919-2016) was a long-time member of the cemetery’s board of directors, and her generosity is unmatched. Section 95A is on the south of the road coming in from California Avenue.